Tackle any objective with the second generation of Lancer Tactical airsoft rifles. The Lancer Tactical Generation 2 SOPMOD M4 RIS Carbine AEG from Airsoft GI represents a whole new strategy for Lancer. It features a new and upgraded, nylon-reinforced polymer body. That makes it a tough, durable rifle, but also one that is lightweight and easy to carry. Toting this light carbine, you can be extremely maneuverable, whether you're running for cover or going on the offensive. Whatever your opponents throw at you, you'll stay in the fight longer. Available in your pick of black or tan, this carbine is a replica of a Special Operations Peculiar MODification (SOPMOD) rifle. It utilizes a quad rail handguard, so you can install your favorite attachments, such as grips and rail covers (included with this gun), flashlights, PEQ boxes and more. 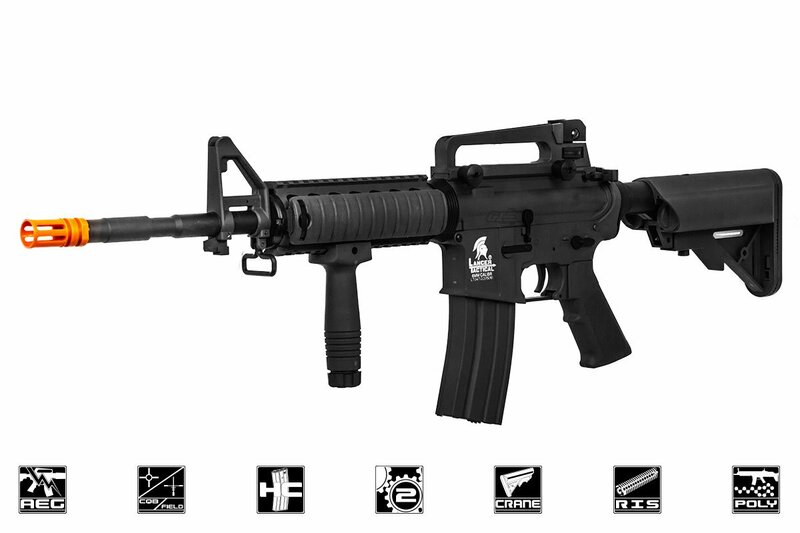 You'll be able to adapt to changes in your style and the type of airsoft you play with this versatile carbine. The gun also features an adjustable front and rear sight, so you can dial in and zero your shots, and a detachable carry handle, so you can attach your favorite optic. Add a red dot if you like. Any way you cut it, you will be hitting your targets with stinging accuracy. A sling loop in the front and a QD point in the rear make attaching a sling a snap. Your rifle will be even more comfortable to handle with this simple addition. Inside, the second generation of these Lancer Tactical rifles comes with standard Version 2 gearboxes. That means upgrades and modifications will be no problem as your skills grow and the game and industry change. These upgraded gearboxes deliver great performance and value. They include an upgraded motor, 8mm ball bearings to ensure the gears spin more efficiently with less friction, a quick-change spring system and low-resistance wiring to provide steady electrical flow from your battery to your rifle. To help ensure more precise, accurate shots at range, the rifle also has a 6.03mm tight-bore barrel and a rotary dial hop-up unit. This model shoots approximately 375 to 395 feet per second out of the box, making it field legal and perfect for long-range engagements. These guns come with a high-capacity magazine, a 9.6V battery and a smart charger, all starting at an incredibly low price for the entire package. A great choice for beginners, intermediates or anyone interested in grabbing a great deal on a great gun, this carbine will grow with you and on you. So pick one up and get in the game without losing your shirt. ALMOST perfect starter airsoft gun! Received my LT04 the other day and boy was I surprised. I watched a few Youtube video talking about these guns and decided to give one a shot. 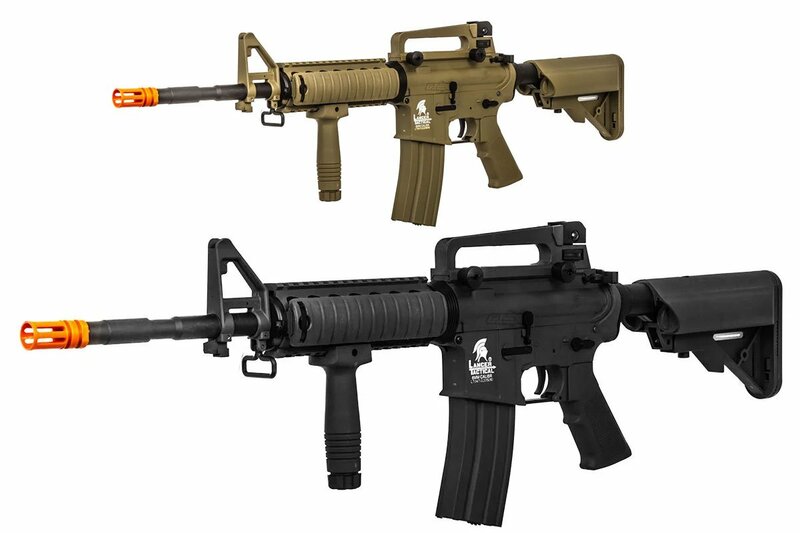 I have always liked the M4 SOPMOD RIS style of airsoft guns. This model brings me back to memories of my first airsoft gun a TM M4 RIS. Now, in no way will the Lancer Tactical version compare to a TM M4 RIS. However, this is not a 300-400 dollar Tokyo Marui AEG. For $110 bucks you canÂ’t really complain. The gun looks and shoots great at a bargain price. Â•	Plastic Buffer Tube ( Replaced with LT-M4BT ) a metal buffer tube. Really good m4 for new players. This gun is nice and light and has the performance a beginner will need. This gun is nice and accurate and has decent range for a new player. I removed the front and rear sight and added a reflex red dot and after adjusting my hop up i was hitting my targets 9 times out of 10. Overall this gun is a great gun for new players and is WAY better than the rental guns. Highly recommended for any new player who wants a good gun at a good price. It should be a counter clockwise 14mm threading. Yes the buffer tube is metal. Can you put a mock suppressor on this? Is the gun threaded under the orange flash hider so you can put a mock suppressor on it? What kind of mags can you use in this. Im getting into airsoft and I dont know what mags are compatible with this gun. What is the size of the rifle? It is approximately 31.5" to 34.75" in length.